In stock -This product will ship today if ordered within the next 8 hours and 36 minutes. 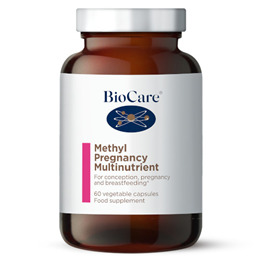 Folate (folic acid) is provided in the `5-MTHF` (Methylfolate) form at current Government recommended levels for pregnancy (400mcg per two capsules) 5-MTHF is the natural form of folate found in food such as leafy green vegetables and is already active and ready for the body to use Selenium and zinc contribute to normal fertility and reproduction. Vitamin C (as Magnesium Ascorbate), Calcium Citrate, Capsule Shell (Hydroxypropyl Methylcellulose), Magnesium Citrate, Choline Bitartrate, Ferrous Citrate, Vitamin B6 (as Pyridoxal-5-Phosphate), Spirulina (Athrospira platensis Algae), Zinc Citrate, Potato Maltodextrin, Vitamin E (as D-Alpha Tocopheryl Succinate & Natural Mixed Tocotrienols & Tocopherols), Sodium Alginate, Dicalcium Phosphate, Niacin (as Nicotinamide), Acacia Gum, Beetroot Extract (Beta vulgaris Root), Modified Corn Starch, Natural Mixed Carotenoids, Vitamin D3 (preparation as Cholecalciferol (Lichen) with Tapioca Maltodextrin, Corn Starch, Coconut Oil, Sucrose, Silicon Dioxide, D-Alpha Tocopherol, Ascorbyl Palmitate), Anti-Caking Agent (Silicon Dioxide), Sucrose, Microcrystalline Cellulose, Copper Gluconate, Pantothenic Acid (as Calcium Pantothenate), Mono/Di and Triglycerides, Corn Starch, Pea Starch, Sodium Borate, Hydroxypropyl Cellulose, Corn Maltodextrin, Corn Dextrin, Sorbitan Stearate, Thiamine (as Thiamine Mononitrate), Riboflavin, Antioxidants (Ascorbyl Palmitate, DL-Alpha Tocopherol & Mixed Tocopherols), Vitamin K2 (as Menaquinone-7), Manganese Gluconate, Tricalcium Phosphate, Folic Acid (as Quatrefolic® [(6S)-5-methyltetrahydrofolic acid glucosamine salt]), Medium Chain Triglycerides, Vitamin A (as Retinyl Acetate), Citric Acid, Potassium Iodide, Chromium Picolinate, L-Selenomethionine, Sodium Molybdate, Vitamin B12 (as Methylcobalamin), Rosemary Extract, Biotin, Vitamin K1 (as Phylloquinone). Long term intakes of amounts greater than 10mg vitamin B6 daily may lead to mild tingling and numbness. 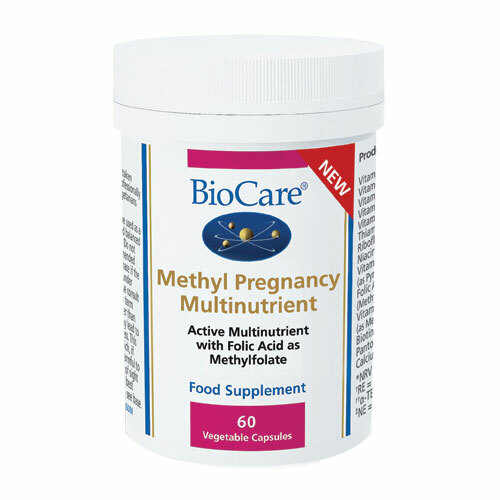 Below are reviews of BioCare Methyl Pregnancy Multinutrient - 60 Vegicaps by bodykind customers. If you have tried this product we'd love to hear what you think so please leave a review.